Eight candidates will be on the June 11 ballot for the six seats on the Mason Crest PTO Executive Board. 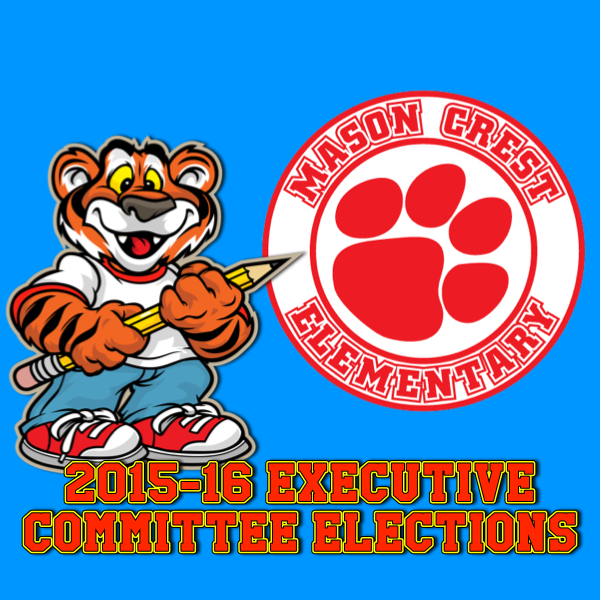 The election will take place during the Mason Crest PTO meeting on June 11 at 6:30 pm in the Mason Crest Library. Paid members of the PTO who cannot attend in person may assign another paid member to vote in proxy by completing the Special Meeting Proxy Form available at masoncrestpto.org. The nominees for the position of PTO President are Tim Sample and Monica Buckhorn. The President manages the overall objectives and strategies of the PTO, acts as a liaison between the parents and the Mason Crest staff, and organizes the PTO meetings and events. Johanna Murphy and Cara Annexstad are the nominees for the VP of Communications. The Vice-President of Communications coordinates the electronic and print communications of the organization including weekly announcements and regular newsletters, arranges language translations and interpreters for official events sponsored by the organization. The nominees for the Vice-President of Finance (Sandra Miracle), the Vice-President of Administration (Elizabeth Bille), the Vice-President of Ways and Means (Christy Fase) and the Vice-President of Community Outreach (Patrick Krason) are all running unopposed. The Mason Crest PTO Vice-President of Finance maintains custody of all organizational funds, keeps a full and accurate account of receipts and expenditures, and makes disbursements. The Vice-President of Administration records the minutes of all meetings, ensures all meetings follow procedures and rules or order and maintains membership and an accurate historical record of the association. The Vice-President of Ways and Means identifies and organizes the organization’s fundraising opportunities (and events that benefit the PTO mission as well as its primary financial needs), and is responsible for the recruitment of committee members for fundraising events. The Vice-President of Community Outreach coordinates the recruitment of volunteers for PTO needs, establishes family-outreach programs, maintains a volunteer database, and creates a PTO presence at all school events. For questions regarding the election, contact the current Mason Crest PTO president, Rock Rockenbach at rock.rockenbach@masoncrestpto.org or our Nominating Committee members, Crystal Krason at crystal.krason@masoncrestpto.org and Daniela Raik by email at daniela.raik@masoncrestpto.org. This site created and maintained by Kent Creative Media Services for the Mason Crest Elementary School Parent Teacher Organization. The Mason Crest PTO is a participant in the Amazon Services LLC Associates Program, an affiliate advertising program designed to provide a means for sites to earn advertising fees by advertising and linking to amazon.com.